Put the chickens in a casserole large enough to hold them. Add the carrot, bouquet garni, salt, peppercorns and wine, and enough water to just cover. Bring to the boil, cover, reduce to a gentle simmer and poach for 40 minutes or until tender. Leave to cool in the liquid; this takes some time, so you could even leave them overnight. To make the sauce, heat the oil in a saucepan over a medium heat, add the onion and cook gently for 3-4 minutes. Add the curry powder and cook for 1-2 minutes. Add the tomato purée, wine, bay leaf and 100ml water. Bring to the boil, add salt, pepper and sugar to taste, the lemon slices and juice. Simmer, uncovered, for 5-10 minutes. Strain and leave to cool. Remove the lemon slices. Add the curry mix to the mayonnaise, a little at a time, then add apricot jam to taste. Adjust the seasoning. Stir in 2-3 tbsp of the whipped cream. Take half the sauce and mix with the remaining whipped cream. Joint the chickens, removing the bones with care, and cut the meat into bite-sized pieces. 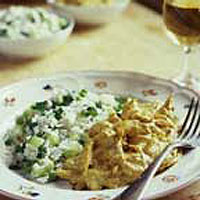 Mix the chicken with the creamier half of the curry sauce. Arrange on a dish and coat with the extra curry sauce. Serve with a rice salad. For the rice salad - rinse 250g white, long grain rice, place in a pan, cover with cold water, add 1 tsp salt and bring to the boil. Cook for 5 minutes, then add 200g frozen petits pois and cook for 5 minutes more. Drain in a colander and refresh under cold water. Leave to cool fully. Meanwhile, whisk together 3 tbsp olive oil, 1 tbsp white wine vinegar, ½ tsp Dijon mustard and some seasoning. Tip the rice and peas into a bowl, stir in ½ diced cucumber, a 20g pack parsley, chopped, and the dressing. Serve.